With the cooler weather upon us it's time to start trying out some delicious stew recipes. 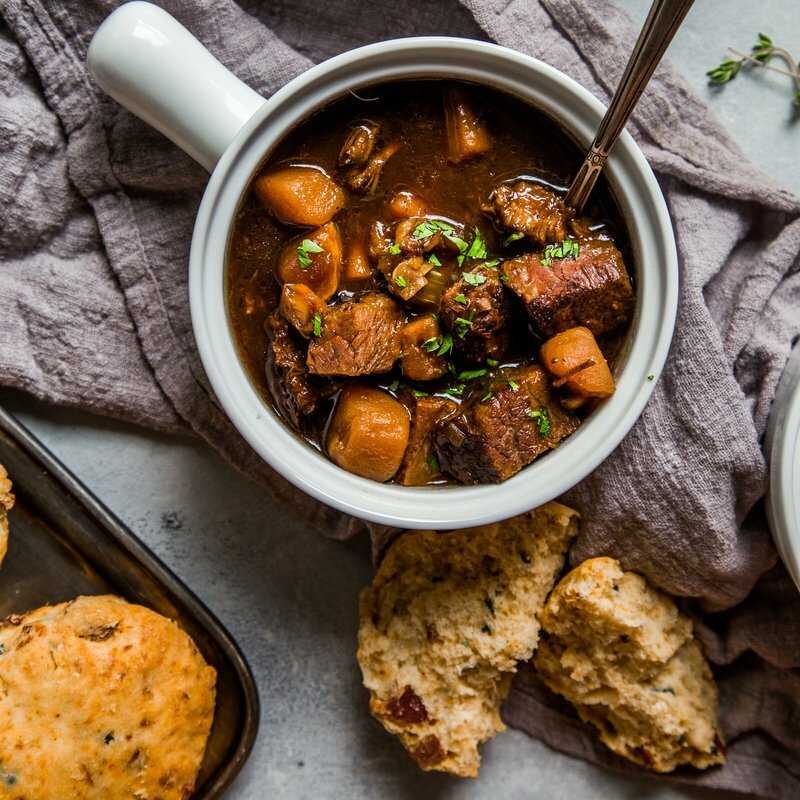 If you're thinking of making a lactose free stew for your family, consider this dark beer braised short rib stew with winter root vegetables—it's absolutely delicious! This recipe makes about four to six servings, and it's great to serve on a cold fall day. After tasting this dish for yourself, please rate and review it, and also feel free to share your thoughts on social media too. We can't wait to hear what you have to say about these delicious short ribs! Beer braised short ribs in a stew don't require that much effort to prepare. In order to get cooking, you're going to need the following ingredients: parsley, thyme, rosemary, flour, salt, two pounds of boneless beef short ribs, canola oil, one and a half cups of Yukon Gold potatoes, parsnips, onion, celery, stout beer, beef broth, turnips and molasses. Once you add everything together, it's going to take up to two hours to cook. But it sure will be delicious once it's all ready! Cabot is a cooperative of 800 family farms, and we've been producing some the most popular cheeses and assorted dairy products. We understand just how much work goes into making high-quality products, which is why we do our best to only offer the best recipes to our fans. We want to make sure that you enjoyed these beer braised short ribs, so after trying them, please make sure to rate and review this recipe. Furthermore, please do share this recipe with your family and friends on Facebook, Twitter and Pinterest. We can't wait to hear from you all! TIE parsley stems, thyme and rosemary into bundle with butcher's twine and set aside. STIR together flour and salt In large bowl; add short ribs and toss to coat. HEAT oil in large pot over high heat. Add short ribs and cook, turning, until browned, about 5 minutes. Transfer to plate and set aside. REDUCE heat to medium-high. Add diced potatoes and vegetables, and bay leaves to pot; cook, stirring occasionally, until vegetables begin to brown. ADD beer, stirring to loosen browned bits on bottom of pot. Add molasses; bring mixture to simmer and cook until liquid is reduced by half. ADD beef broth, reserved short ribs and herb bundle and bring to boil. Lower heat to maintain gentle simmer and cook until meat is very tender, 1½ to 2 hours. Remove and discard bay leaves and herb bundle. Add additional salt and pepper if needed. Serve with Cabot Chipotle Cheddar and Bacon Biscuits.